There are a lot of wild flowers in the forest that emit fragrant scent. Some of them include Glory Vine, White Rhododendron, Plumeria, Cananga, tiger orchid, and a white terrestrial orchid which I don't know its scientific name. This flower plant usually can be found growing at the bank of a river. I saw it for the first time in lowland forest of Manokwari when I guided two Dutch tourists on a 3-day/ 2-night riverwalk, camping, birding and wildlife watching tour. The flowers were abundant and very fragrant. I took some pictures of these white flowers but still did not know its name. Later, a British girl contacted me to study about rhododendron in Arfak mountains. I sent her the photographs of the flowers and asked the name of the plant. 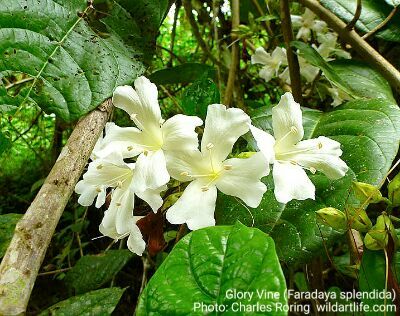 Her friend who worked in Kew botanical garden said that its name was Glory Vine (Faradaya splendida). Actually it was very potential to be developed as essential oil. After the flower season, the vine will produce fruits that look like potato. The leaves of Glory Vine were quite big, green and glossy. The middle layer of its bark was traditionally used by the Aborigin to poison fish. Tiger Orchid is perhaps one of the largest orchid plant in the world. It is also called Queen of the Orchids. When I was a little boy, I saw it growing next to Catholic church Saint Augustine of Manokwari. Years later, when I did an exploratory trip to eastern Waigeo island, I saw the flower plant at a cliff of a cape in Fish Lagoon area. I climbed the cape to find a good spot for seeing the beautiful landscape of the lagoon. As soon as I saw the flower of the orchid, I took some pictures of them. This shrub plant grows on tops of Arfak mountains usually from the elevation of 2,000 meters above sea level and higher around Anggi Lakes. 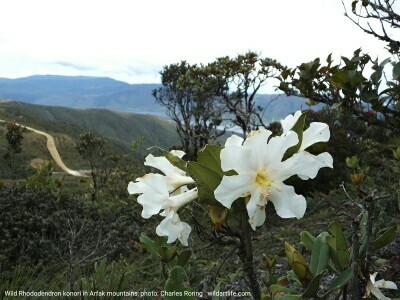 The best location for seeing the Arfak White Rhododendron is the ridge of Mount Sensenemes at the elevation of nearly 2,700 meters. I organize sightseeing tour to the region for tourists who like to see the flowers. The rhododendron plant grows up to 2.5 meters or even 3 meters. The flowers look similar to the above Glory vine that lives in lowland area. There are also Rhododendron asperum, Rhododendron laetum and Rhododendron zoelleri in the forest of Arfak range. In addition to seeing flowers, visitors who take this tour can see magnificent view of the scenery, meet indigenous people of Sougb or Hatam tribes and even stay in their traditional Kaki Seribu house. The temperature in this range is cool at night. Bringing jacket, socks, and gloves is highly recommended.